The land on which the town sits belonged to Jilotlán. In 1737 a few Aborigines living in the village of Tecalitlán, which then stood at the eastern hill of La Cruz, where today a dam is located. In that year some families took up residence Spanish and indigenous land rented them in 1774 were denounced as unappropriated. the name of Valle de Nuestra Señora de Guadalupe de Tecalitlán. In 1781 he was awarded the title of town with four leagues legal fund. While in some pulpits Independence movement condemning causing the subsequent retaliation from insurgents, the priest José María Arzac formed a royal army with 400 soldiers to pursue insurgents. These reacted violently. In 1815 a captain entrenched in the village and serious excesses were committed. The temple was looted and destroyed the parish archives. Arzac was parish priest of the town from 1808 to 1814. In the City Hall is the original book of the founding of "Tecalitlán" in 1774. In 1825 Tecalitlán was a town with town hall belonging to the 4th canton of Sayula until 1870 it was transferred to the 9th of Zapotlán Great, remaining within the department Tamazula. The decree that created this county is unknown, but already existed as such in 1870, as the decree of October 28 of that year speaks of his existence. * The Parish of St. Mary of Guadalupe built in the nineteenth century, is Ionic. It has been remodeled several times. The Temple of the Third Order, dedicated to San Francisco, construction began on February 19, 1894. Its architectural style is also Ionic. * In the Home Garden are four metal busts erected in honor of Don Miguel Hidalgo y Costilla; the Father of the Americas, Benito Juárez; Captain Miguel Pérez Ponce de León founded the population, and one that pays homage to Don Silvestre Vargas Vazquez. In the Temple of the Third Order are some paintings dating from the nineteenth century, by an anonymous author. In the Municipal Palace is a painting dedicated to Miguel Hidalgo y Costilla dating from the nineteenth century, also anonymous author. For its roots among the population highlights the religious celebrations, the main can be mentioned: May 3, day of Santa Cruz; May 15, day of San Isidro; June 24, the day of San Juan Bautista; San Francisco Day is celebrated on October 4; November 2, Day of the Dead; November 16 is celebrated Santa Gertrudis; and from 1 to December 12 the docenario and celebrations are held in honor of Our Lady of Guadalupe, making pilgrimages by different groups and colonies of the population. For its roots among the population highlights the celebration of religious character, the main can be mentioned: May 3, day of Santa Cruz; May 15, day of San Isidro; June 24, the day of San Juan Bautista; San Francisco Day is celebrated on October 4; November 2, Day of the Dead; November 16 is celebrated Santa Gertrudis; and from 1 to December 12 and the novena celebrations are held in honor of Our Lady of Guadalupe, making pilgrimages by different groups and colonies of the population. It is said that on the hill of the Santa Cruz daily a goat at midnight will appear; so it was said that this hill was delighted. Currently at the top of this hill is the sign of the cross on a small chapel. 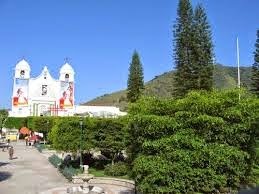 The celebration of the festivities in honor of Our Lady of Guadalupe in December, dating from the colonial era, they concur besides the inhabitants of the town, visitors from other municipalities in the state. Prior to December 12, novenario alba, rockets, "mañanitas" is celebrated. Peal of bells and music in the streets. At night is done daily, a serenade in which swarms confetti, streamers and flowers; plus fireworks burn. On December 11 there burning castle. The eve of the festival, evening, devotees will visit the venerated image of the Virgin of Guadalupe; and overnight showy dances are danced. These celebrations are called "The Evening". On the 12th the festivities begin with the traditional "mañanitas" and then there is a parade of floats. Several teams of dancers, among which groups called "The Conquest", "The American", "The Rattles" and "San Pedro" also participate. In the afternoon groups of pilgrims arriving at the population received; at night serenade is made and no burning castle.